Pick a category to suit your style! 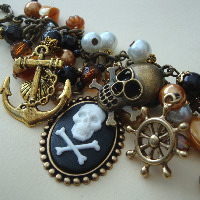 Pirate jewellery - whether you love the pirate style or nautical look, or want some quality accessories for a fancy dress costume, the pirate range has necklaces, bracelets, earrings, pirate hair beads from a simple skull and crossbones to an elaborate design full of beads and pirate charms. 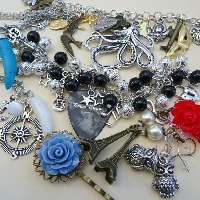 Vintage inspired and Cool jewellery - from nostalgic, old-fashioned, whimsical style full of china tea pots, butterflies, roses, bird cages, Paris theme designs with Eiffel Tower charms and the fabulous octopus range in a variety of styles, to unisex rock'n'roll lifestyle guitar string bracelets and plectrum jewellery with music theme charms, statement charm necklaces and bracelets as seen on several bands on stage in London's coolest venues! 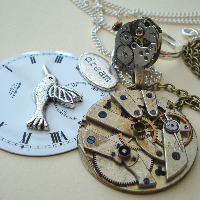 Steampunk jewellery - steampunk cufflinks, necklaces, rings, earrings and brooches made with vintage watch and pocket watch movements, cogs and gears, plus a little of the Victorian fascination with insects, sea creatures and hot air balloons! All are handmade in Greater London, UK.